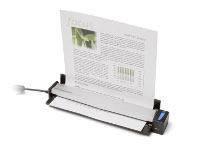 TheScanSnap S1100 Mobile Scanner - Takes document scanning just about anywhere! At nearly 12 ounces, the ScanSnap S1100 is the perfect mobile companion for front-side document scanningat home or on the road. Whether scanning receipts, contracts, recipes, or plastic cards, ScanSnap takes scanningbeyond the desktop and into your world.